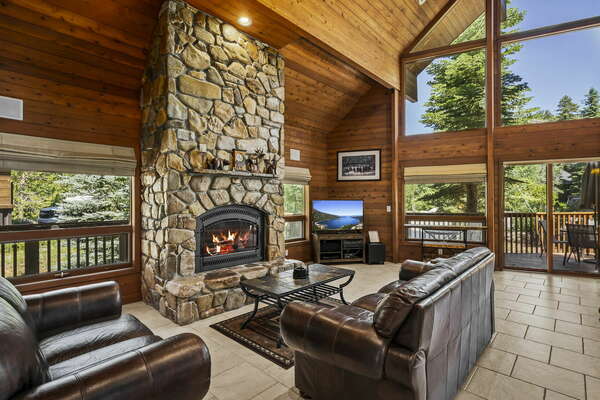 Our Skislope Truckee Vacation Cabin awaits your arrival, this beautiful 3 bedrooms+loft and office, with 3.5 bathrooms is the perfect mountain cabin for a family Tahoe vacation. Skislope Truckee Vacation Cabin will make you feel at home, the moment you step inside, with an open concept living area a beautiful deck, and back yard, for those summer nights under the stars, this vacation Cabin will become a favorite. The Cabin sleeps 9 and is perfect for two families with kids traveling together, or a group of friends joining in, on the main floor you’ll find the living room with an attached half bath, the master suite, and an office, just off of the master. Overlooking the living room is the loft with 3 twins and a full bathroom, on the floor below, there are 2 guest bedrooms with queens and a full bath to be shared. Cook an elaborate dinner in the beautiful kitchen, relax by the gas stove, or with a book on the back deck, this house will be the perfect home away from home on your Truckee vacation. The eat-in kitchen is right off the living room, with lots of cabinets and all appliances. The kitchen and dining space are open to the living room, so you can enjoy everyone’s company. Or take your feast to the back deck, the choice is yours. It’s vacation! In the winter when snow and ice are present, the driveway can become quite slick and will pose a problem for unprepared vehicles. Chains are a requirement, especially if you do not have a 4WD or AWD vehicle with Snow Tires specifically. Our Skislope Truckee Vacation Cabin is a great property to spend your summer as well as your winter vacations, Tahoe Donner Association gives you access to the clubhouse that has 2 swimming pools (a heated lap pool open year round and a big pool open in summer only), 3 hot tubs, 2 saunas, a cardio and a weight room. There is also a golf course and tennis courts only a few minutes drive from the house as well as a private association beach on the east end of Donner Lake. Tahoe Donner has a ski resort as well that's available for your enjoyment, especially great if you have children. You won't even need to leave the area because of all the great activities offered including 2 restaurants, hiking and biking trails just as you walk out your front door, enjoy our private vacation home as much as we do.